Modern Clinic Design: Strategies for an Era of Change is a comprehensive guide to optimizing patient experience through the design of the built environment. 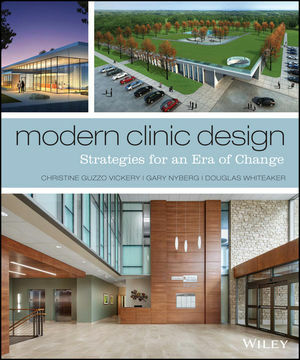 Written by a team of veteran healthcare interior designers, architects, and engineers, this book addresses the impacts of evolving legislation, changing technologies, and emerging nontraditional clinic models on clinic design, and illustrates effective design strategies for any type of clinic. Readers will find innovative ideas about lean design, design for flexibility, and the use of mock-ups to prototype space plans within a clinic setting, and diagrammed examples including waiting rooms, registration desks, and exam rooms that demonstrate how these ideas are applied to real-world projects. Spurred on by recent healthcare legislation and new technological developments, clinics can now offer a greater variety of services in a greater variety of locations. Designers not only need to know the different requirements for each of these spaces, but also understand how certain design strategies affect the patient's experience in the space. This book explores all aspects of clinic design, and describes how aesthetics and functionality can merge to provide a positive experience for patients, staff, and healthcare providers. A well-designed clinic is essential for the well-being of the patients and health care providers that occupy the space every day. The healthcare industry is shifting, and the healthcare design industry must shift with it to continue producing spaces that are relevant to ever-evolving patient and worker needs. For complete guidance toward the role of design, Modern Clinic Design is a thorough, practical reference. Christine Guzzo Vickery, CID, EDAC, is Vice President and Senior Interior Designer with HGA Architects and Engineers and leads HGA's Healthcare Research Collaborative. She additionally speaks at national healthcare conferences, contributes regularly to industry journals, and writes a monthly Blog for Healthcare Design Magazine. She has a Bachelor of Arts from the University of Iowa. Gary Nyberg, RA, is a retired Healthcare Principal from HGA Architects and Engineers, where he specialized in medical planning, master planning and design for more than 30 years. He has a Bachelor of Architecture from the University of Minnesota. Douglas Whiteaker, AIA, is a Healthcare Principal with HGA Architects and Engineers. He teaches sustainable design at Cosumnes River College in Sacramento, and leads Architect Registration Exam prep seminars. He has a Master of Architecture from the University of Nebraska-Lincoln, and a Bachelor of Science in Advanced Technical Science in Architecture from Southern Illinois University-Carbondale.